In the southwestern peninsula of Bali amid 222 acres of private tropical forest, you’ll find the expansive AYANA Resort and Spa, BALI. A winding road leads from the entrance through the forest, and depending on the season, it is possible to encounter the road and jogging paths dusted in a layer of white due to blooming cotton trees. So vast is this area of land that no other resort is visible from AYANA, not even Rimba, its new sister hotel that guests have access to via complimentary shuttle. AYANA Resort and Spa is ideal for travelers who want to enjoy leisurely walks or runs, gardens full of colorful tropical flowers, stunning views of the sea, top-notch service and priority access to Spa on the Rocks and Rock Bar — two world-famous venues perched on natural sea rocks that offer experiences like no other. 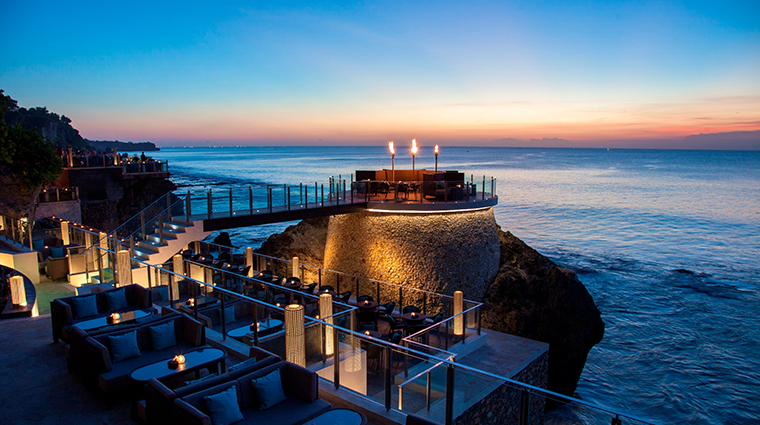 You won’t want for dining options at this Bali resort. From Japanese to Indonesian to Indian to Chinese to Western cuisine, there are a variety of venues to choose from with different views and settings. 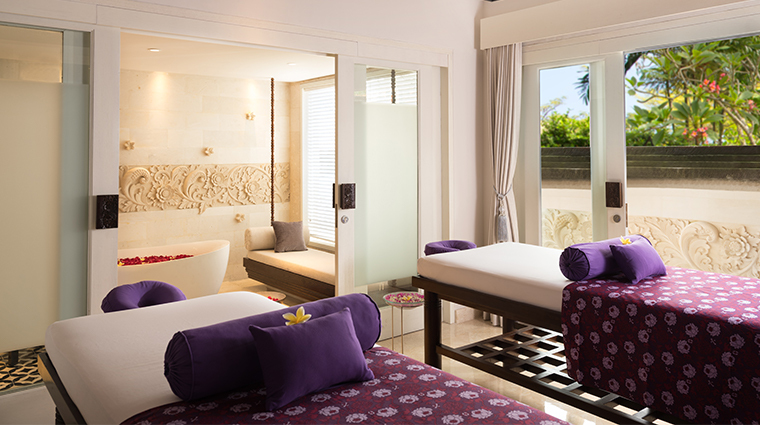 The luxury hotel’s Thermes Marins Bali spa boasts 53 treatment rooms and villas spread across a two-story complex dotted with fountains and koi ponds. Located in two spectacular spa villas perched atop a rocky outcrop surrounded by the sea, the exclusive Spa on the Rocks has its very own menu created specifically to match the breathtaking setting. The resort’s spa is also home to one of the world’s largest Aquatonic jet pools with water directly supplied from the Indian Ocean. 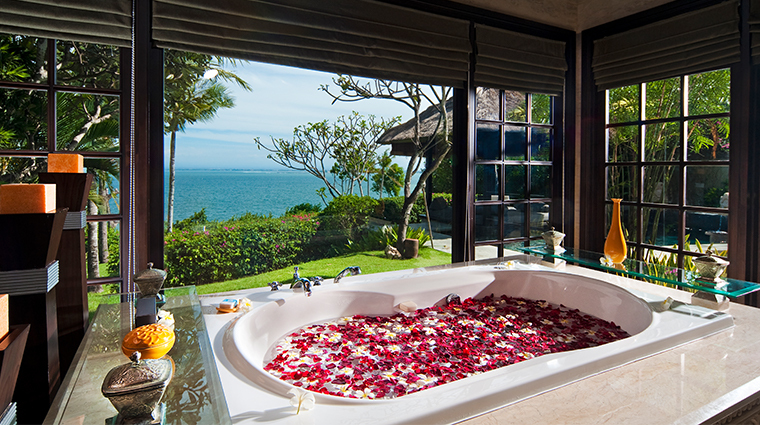 In addition to indulgent treatments, a visit to the Bali resort’s spa affords you access to steam and sauna rooms, a Jacuzzi grotto and cold plunge pool, a beauty salon, a gym, a spa boutique and a café. You can’t miss a visit to Rock Bar, which requires a ride down a cliff face in an inclinator to reach it. The stunning, one-of-a-kind roofless bar seats 880 people and is anchored on natural rocks about 46 feet above the ocean. In-house guests enjoy priority access to Rock Bar and can avoid the long queues. The 236,000-square-foot facility is the only Thermes Marins spa in Southeast Asia and provides both Eastern and Western therapies. 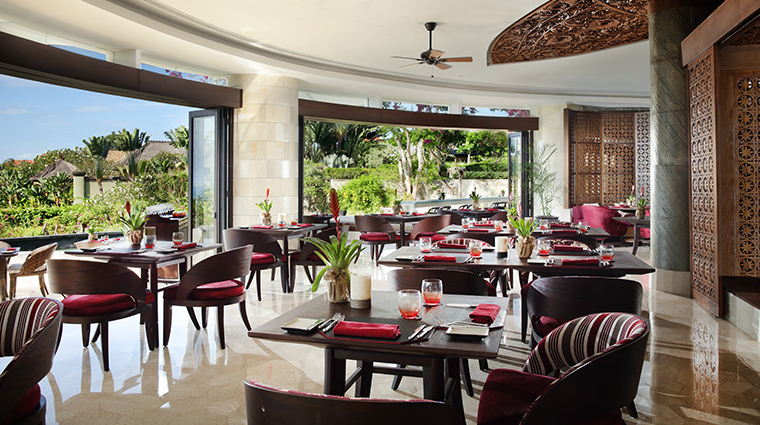 For an authentic taste of Bali, sign up for a class at the resort's own Scenography Cooking School. Opt for just the in-depth cooking class, or pair your lesson with a local market tour and a Balinese ritual at the onsite temple for a truly immersive experience. 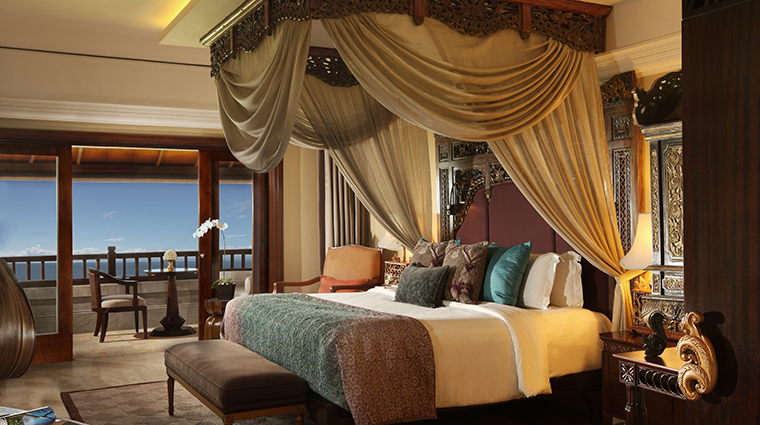 AYANA’s 290 rooms and suites feature contemporary décor with traditional touches. 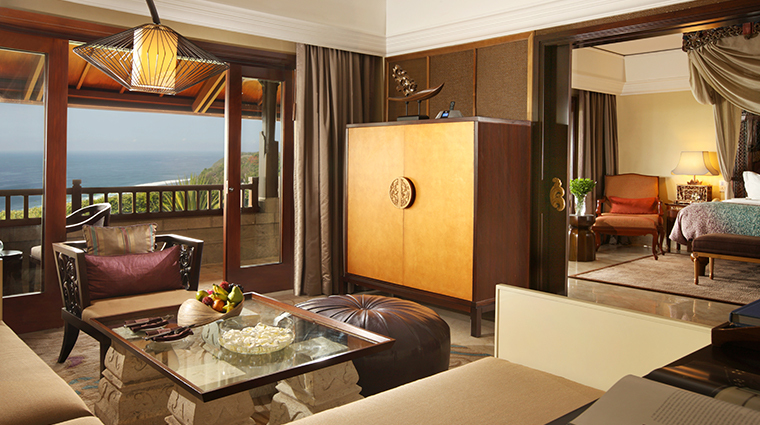 The upper floors offer balcony views of either the Indian Ocean or exotic gardens while the ground-floor accommodations give you direct pool access. For the ultimate in luxury, try the Bali hotel’s villas, which come with personalized service from internationally certified butlers. The exquisite bedrooms and bathrooms have intricate stone carvings on the walls, below the his-and-her sinks, and along the large soaking tub. 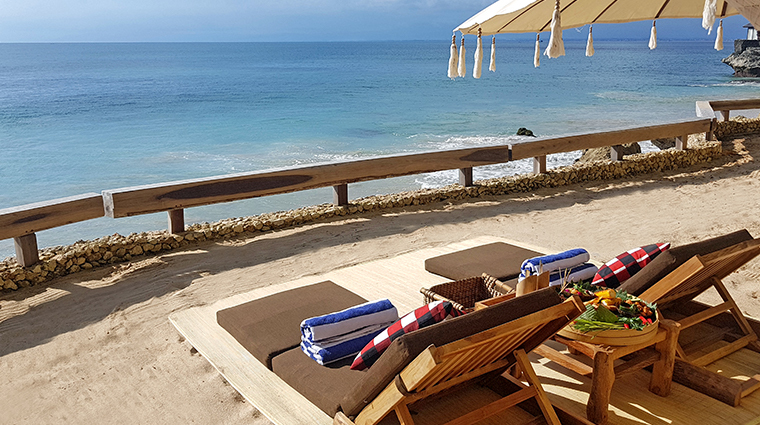 This décor, along with the alang-alang thatched roof, the private plunge pool and the outdoor cabana, creates an environment that is perfect for hiding away. 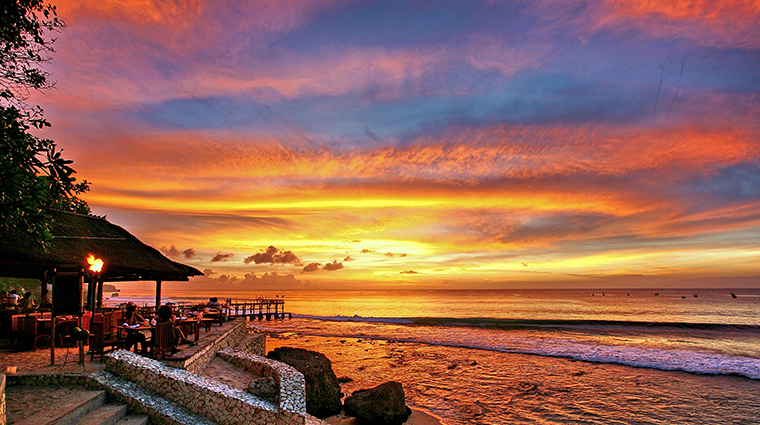 Visit the nearby fishing village of Jimbaran at daybreak to see the markets and the fisherman coming in with their fresh catches of the day. 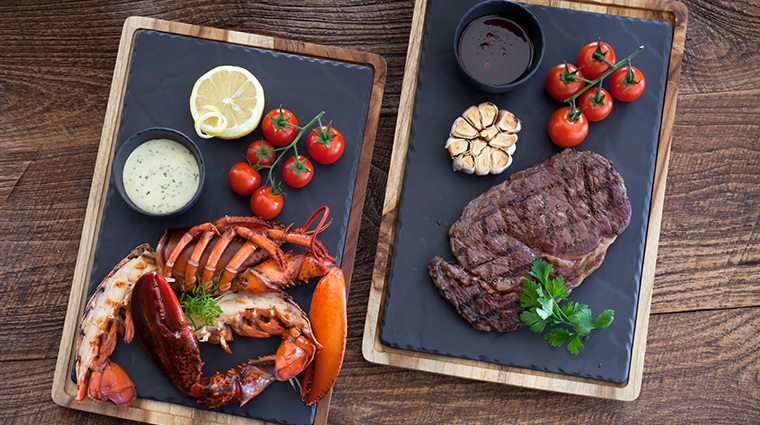 At sunset, tables and chairs are set out on the sand in front of beach shacks and the beach transforms into a lively area where you can choose from a selection of seafood and have it weighed and grilled to perfection. 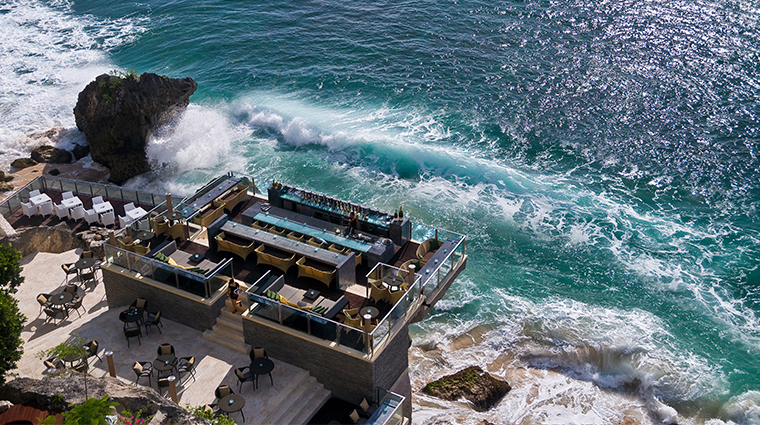 It takes about five minutes by car to get to Jimbaran beach from the resort, a half hour to reach the famous Uluwatu temple and a number of popular beaches and surf breaks. About a half hour trek in the other direction will get you to Seminyak, South Bali’s most popular area for shopping and dining.